As the business end of the season approaches with just two games to be played in May, it’s time to look back at how the votes totalled for the GOT Player of the Month for April. Just four games saw the Blues go undefeated with two draws and two wins for eight points from a possible twelve. 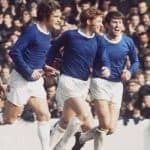 Whilst that could be construed as a reasonable return, the nature of the two draws against ‘them’ from across the park – a game most Evertonians and even many of ‘them agreed we could and should have won – and a simply diabolical showing away at Swansea brought more criticism of the manager and his overly defensive and conservative tactics. If the Swansea game needed any further castigation, it produced the lowest number of votes cast for the MotM so far this season. The victories over Newcastle and a shot-shy Huddersfield were achieved with three goals from a mass total of just six attempts on target, hardly the stuff of entertainers, but at least they were victories. Just seventeen players saw first team action in April, the same as February with six players featuring in all four games – Jordan Pickford, Leighton Baines, Michael Keane, Phil Jagielka, Theo Walcott and Seamus Coleman. April saw a return to the first team for Ramiro Funes Mori and something of an overdue but welcome return to something like the form we know he’s capable of for Morgan Schneiderlin. The Frenchman has been vilified for much of the season following a series of awful performances, but he romped home as the Man of the Match in the one-nil win over Newcastle, polling twice as many as the next player. Along with Morgan, Jordan Pickford continued his good form with two MotM awards, and a popular winner for the Huddersfield game where he topped a solid showing with an excellent goal to seal the points was Idrissa Gana Gueye. April saw the closest race for the monthly award with just eighteen votes separating the top three, and so to the drum roll and revealing of the top three vote recipients. In third place and largely courtesy of the Newcastle game is Morgan Schneiderlin. In second place, by just one more vote, is the ever popular Seamus Coleman.